Most individuals with brain damage experience a curtailment or loss of lifestyle without rehabilitation. Improved methods and appropriately timed medical interventions now make it possible for more individuals to survive brain insults and to be assisted by rehabilitation neuropsychologists in achieving renewed commitment to life. Damage to the brain -- the organ of human emotions and cognition -- reduces psychological functioning and realistic adaptation, and the patient and his/her family are often encapsulated in the time prior to injury. To regain part or most of the lifestyle lost, an honest, dedicated, and realistic approach is required. Neuropsychological rehabilitation can provide tools for this task, provided that the most comprehensive, elaborate and knowledge-based methods are integrated in the training, and provided that knowledge from many disciplines and from community environments and family is encompassed. In the present book knowledge representing the development of neuropsychological rehabilitation during the past five years is collected from a conference titled "Progress in Neuropsychological Rehabilitation." 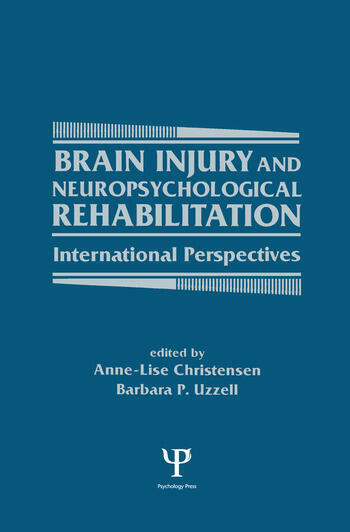 The chapters are written by professionals who were invited to share their experiences from different areas within the field because of their expertise with processes involved in neuropsychological rehabilitation. After a historical review, the chapters follow a visible sequence from biology to neuropsychology and neuropharmacology. Experts discuss the most advanced medical knowledge of the effect of injury on states of the organism. The second part of the book is dedicated to the outcome and the economics of rehabilitation as well as plans for the future. Finally, a panel discussion addresses the overall concept: Is rehabilitation worthwhile and ethical? The reactions -- influenced by the cross-cultural exchange of knowledge -- shed light on the essence and practice of today's neurorehabilitation. Contents: Preface. E. Dragsted, Foreword. L. Diller, Finding the Right Treatment Combinations: Changes in Rehabilitation Over the Past Five Years. D.G. Stein, M.M. Glasier, S.W. Hoffman, Pharmacological Treatments for Brain-Injury Repair: Progress and Prognosis. D.N. Cope, Head Trauma Destiny: Interactions of Neuropharmacology and Personality. T.G. Bolwig, Some Pathophysiological Aspects of Chronic Organic Brain Syndrome Illustrated by the Use of Brain-Imaging Techniques. J. Risberg, L.R. Jensen, The Value of Regional Cerebral Blood Flow Measurements in Neuropsychological Rehabilitation. B.A. Wilson, A. Shiel, M. Watson, S. Horn, L. McLellan, Monitoring Behavior During Coma and Posttraumatic Amnesia. L.E. Trexler, P.M. Webb, G. Zappala, Strategic Aspects of Neuropsychological Rehabilitation. R. Laaksonen, Cognitive Training Methods in Rehabilitation of Memory. F-J. Stachowiak, Computers in Aphasia Rehabilitation. G. Rasmussen, A New Approach to Physical Rehabilitation. G.P. Prigatano, Individuality, Lesion Location, and Psychotherapy After Brain Injury. Z. Groswasser, Rehabilitating Psychosocial Functioning. D.N. Cope, Traumatic Brain-Injury Rehabilitation Outcome Studies in the United States. D.W. Ellis, G. Spivack, C.M. Spettell, Rehabilitation Treatment Variables that Affect Outcome After Brain Injury. T.W. Teasdale, A-L. Christensen, Psychosocial Outcome in Denmark. D.V. Bistany, Overview of the Economics of Rehabilitation in the United States. J. Mehlbye, A. Larsen, Social and Economic Consequences of Brain Damage in Denmark: A Case Study. L. Diller, Federal Planning with Regard to Traumatic Brain Injury in the United States. J-L. Truelle, D.N. Brooks, C. Potagas, P-A. Joseph, A European Chart for Evaluation of Patients with Traumatic Brain Injury. A-L. Christensen, Visions for Rehabilitation. G.A. Zitnay, Visions for International Support Organizations. B.P. Uzzell, Panel Discussion. B.P. Uzzell, A-L. Christensen, Postscript. "The chapters are readable, short, and review many new concepts. The book is of interest to all brain injury rehabilitation team members. It also would be useful to professionals entering the fields, particularly psychologists and physicians, post-doctoral candidates, and anyone interested in becoming current in the exploding research and methodologies of brain injury management." "This text offers a comprehensive look at atraumatic brain injury recovery and rehablilitation for researchers and clinicians, with information gleaned from contributed medical and clinical research efforts."